Commercial dip tanks are a convenient and affordable way to keep cooking equipment and grease filters free of carbon and grease build up. Why have your kitchen crew spend hours scrubbing, when dip tanks can get most cooking equipment clean overnight? Simply soak your pans, grills and other cooking equipment in the dip tank and let them sit. Remove, rinse and your cooking equipment will be clean and ready to use. No more scrubbing, chipping, scraping, or effort. Instead of scrubbing and cleaning, your crew can complete other tasks or even work fewer hours, saving on your labor costs. 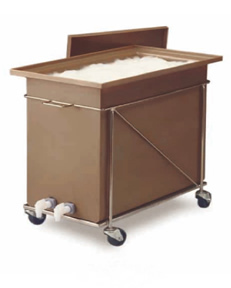 We carry multipurpose soak tanks perfect for any commercial kitchen, including full-service and quick-service restaurants, supermarkets, hotels, motels, and hospital facilities. Our local, family-owned business has been providing responsive, knowledgeable service to commercial kitchens for over 50 years in the business. If you’re ready to buy or rent a dip tank, or want to learn more, call or email The Filter Man. Our family has been serving restaurants, hotels, motels, and hospitals for over 50 years. Contact us today.